Captain Marvel has started her descent. The trailer for the 21st entry in the Marvel Cinematic Universe has arrived with explosive style, teasing a prequel origin story in the same vein as Captain America: The First Avenger. But instead of the 1940s, it's the 1990s — and this time, the Captain in question is decidedly more modern. The movie, scheduled to hit theaters March 8, 2019, centers on the early days and adventures of Carol Danvers, a U.S. Air Force pilot whose DNA becomes fused with a powerful alien species. Unlike the comics, the movie casts her as an amnesiac, returning to Earth with a crash landing after years spent living among the stars. That's not the only thing that's shifted from the comics. The movie's first trailer is packed with references to the storied source material, even as it remixes familiar elements into a new cinematic shape. We're not here to just point out the luscious hair on young Agent Coulson — we're here to show you the real neat stuff you might've missed, to give you a leg up on your peers when this adventure in the Marvel cosmic hits theaters. So suit yourself up in mohawk mode, and follow along as we break down all the little details in the first trailer for Marvel's Captain Marvel. In the comics, Carol originally received her powers by being caught in the blast of an exploding psyche-magnetron. It's a premise that invites the question, "what is the psyche-magnetron?" Well, it's… the thing that gives Carol her powers when she's caught in the blast of an exploding one. In the trailer, Carol can be seen in an Air Force jumpsuit, looking roughed up in the desert, potentially having just had her plane shot out of the sky. She approaches a mysterious box near her crash site, at which point she's enveloped in a grand explosion of thick blue light — an all-time classic giveaway for Made-Up Powerful Comic Book Energy. 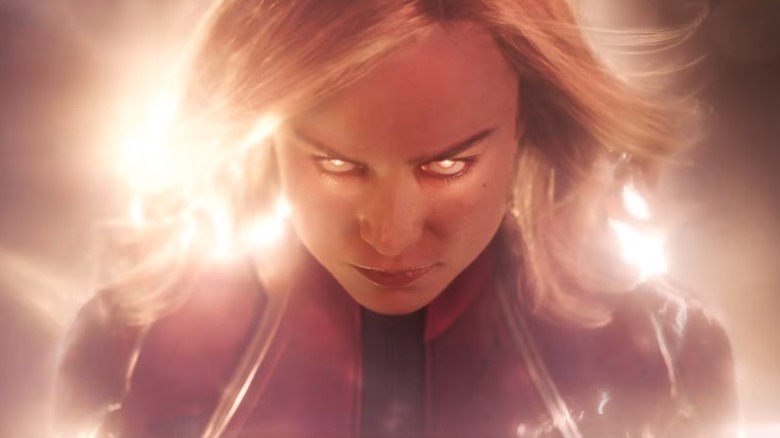 Is this the psyche-magnetron exploding, altering Carol's DNA to give her her powers after crashing to the Earth during a Kree-Skrull dogfight? It seems possible. Put a pin in this one. 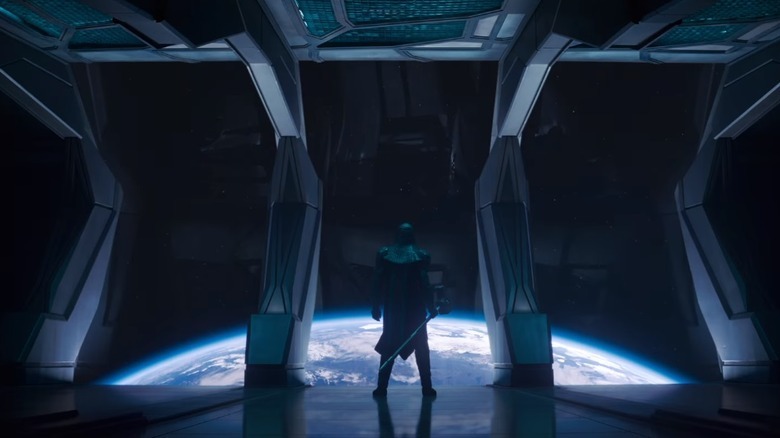 The trailer features a familiar silhouette for MCU fans, spied casting what seems to be a villainous gaze over a whole planet. From the looks of things, this is none other than Lee Pace as the returning Ronan the Accuser, back to life in Captain Marvel through the magic of the prequel. This time, Ronan technically should be on the side of the good guys with Carol, considering his status as a Kree in the Kree Empire. But just because he's of the same species as the heroine (sort of), doesn't mean Ronan will be any less of a blowhard butthead here than he was in Guardians of the Galaxy. In the comics, Ronan made his bones attempting an overthrow of the Kree Empire, bringing him into conflict with Mar-Vell. Whether or not that conflict will be repeated in this movie remains to be seen. It doesn't feel like Ronan will be the main antagonist of this movie, but it's also hard to imagine him as being anything close to a good guy. Either way, he looks to be as pompous as ever on that spaceship bridge of his. Regardless of who he ends up fighting and why, what do you want to bet the odds are that he loses again in a dance fight? This movie's set in the '90s of planet Earth, after all. All the strength of the Accuser Corps is no match for the rhythmic power of the Macarena. Dale a tu cuerpo alegria, my dude. Carol Danvers' isn't the only origin story the Captain Marvel movie appears to be remixing. The movie also seems to be seeding a whole new origin story for another hero once known by the name of Captain Marvel. 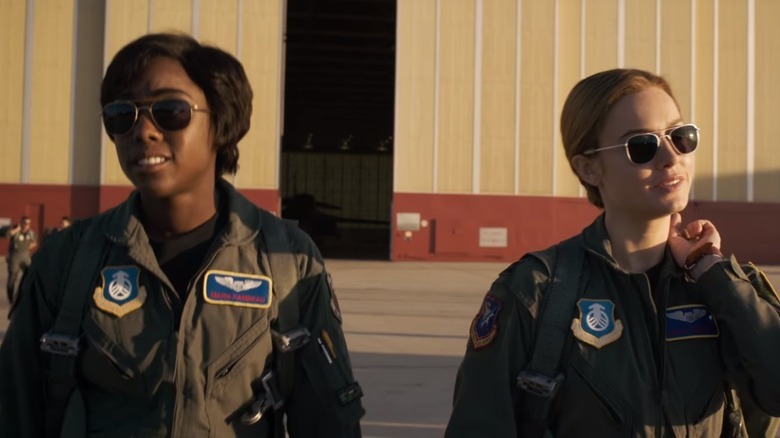 The trailer seems to show a chummy relationship with Carol Danvers and another Air Force pilot by the name of Rambeau, a name which is almost recognizable to comic book fans. All that said, this is not Monica. If you look closely at the nametag, you can see that this surprisingly appears to be a young version of Maria Rambeau — Monica's mother. 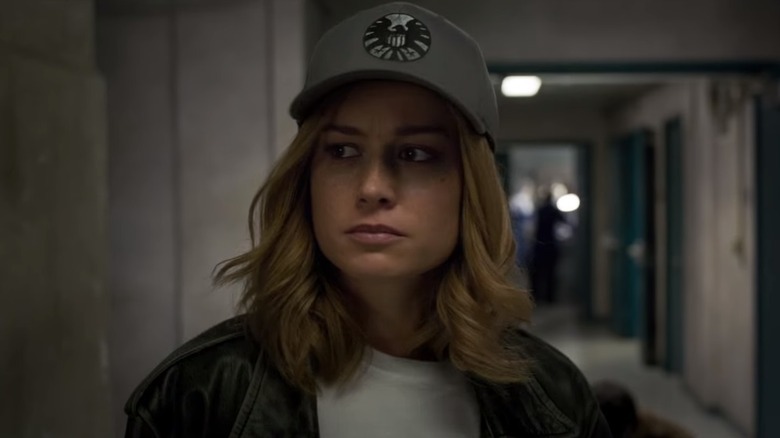 Is Captain Marvel setting up a young Monica to look up to Carol Danvers' Captain, perhaps one day taking the mantle herself in a spinoff or sequel? It seems possible. Could this scene in Carol's past be setting up a later encounter with a grown-up Monica during the present? Perhaps — this could go a lot of places, honestly. Put a pin in this one too — it feels like Marvel's up to something. One of the most low-key exciting parts of the first Captain Marvel trailer is the sight of Carol Danvers in full combat mode. You spent all these months wanting to see her in the suit? Well, here's the suit, buddy — helmet included. Though she was introduced to Marvel Comics in 1968, Carol didn't take on the name of Captain Marvel until 2012. Her switch from Ms. Marvel to Captain Marvel also came with a major costume upgrade. Inspired by the color scheme of the original Mar-Vell's costume, Carol's costume of unbreakable fabric also features a built-in bit of headgear, powered by some handy Kree technology. Though Carol has been established in the comics as having the ability to breathe in outer space, the helmet allows its wearer to breathe in any environment, from the voids between planets to the depths of the ocean. 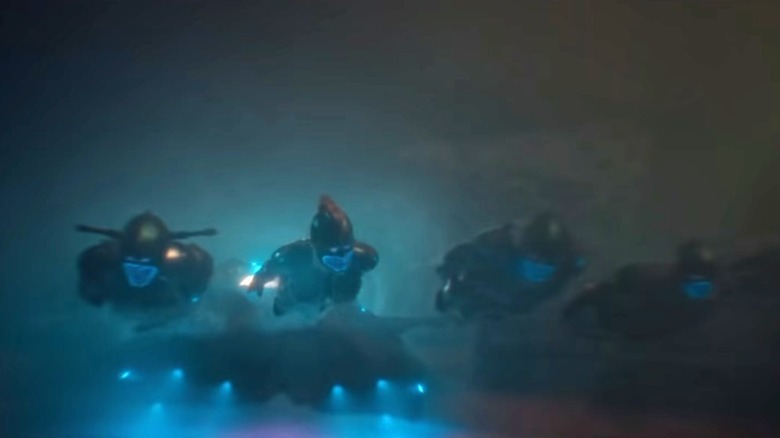 The trailer shows a whole squadron of Kree and Kree-aligned agents scooting around underwater showing off the helmet's protective capabilities, with a blue force field around the exposed lower half of the face. The helmet also has the undeniable benefit of teasing Carol's hair up into what can only be described as a combat mohawk, which is such a fun thing to see, say, and think about. As for the mohawk being an XTREME-ly '90s hairstyle, we swear that's just a coincidence. Even in their solo movies, no Marvel hero goes it alone. During her adventures with the Kree, Captain Marvel has her own powerful collective on her side: a team of fighters known as Starforce. The team has its roots in Marvel Comics, but naturally, a few things changed on the way to the screen. The movie's incarnation of Starforce is an elite squadron, so capable in combat that directors Anna Boden and Ryan Fleck have described them as a spacefaring version of SEAL Team Six. It remains to be seen what role they'll play; from set photos, it appears the group will at one point have at least a tentative alliance with Ronan the Accuser. Prominent members include Gemma Chan as the Kree Minn-Erva and Djimon Hounsou as Korath the Pursuer. Like Ronan, Korath is also a returning character from Guardians of the Galaxy, appearing in Captain Marvel for chronologically the first time. The team is rounded out by Rune Temte as Bron-Char and Algenis Perez Soto as Att-Lass, with Jude Law taking on the mentor role as — most likely — Mar-Vell. The fact that Ronan and Korath turn up later on as villains in the MCU puts a big question mark over the team's fate. (Interestingly, Minn-Erva has also spent some time as a comics villain.) Will the movie see the team splinter into good guys and bad? With the exception of Carol, could all of them be bad? It's worryingly possible. 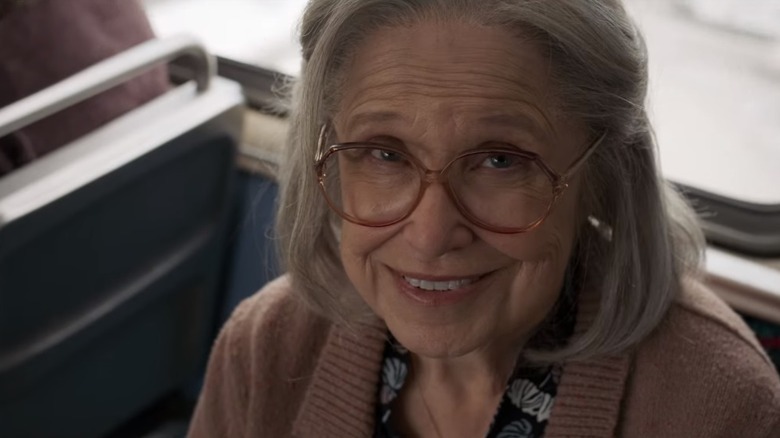 Everyone's going to walk away from this trailer talking about that old lady that Captain Marvel punches out on the subway — and rightly so. Already, it's a feat that feels more satisfying than Thanos getting Thor's axe to the chest. But as you may have suspected, not all is exactly how it seems. In all likelihood, the main antagonists of the Captain Marvel movie will be members of the Skrull, an intergalactic warrior race that once warred with the equally alien Kree. (You can see the aliens just before the old lady appears during the trailer, with the editing implying a connection between the two.) As you might have surmised from the trailer's context clues, the Skrulls are shapeshifters, being in their basic forms humanoid aliens with reptilian or goblin-like qualities. With that in mind, we're betting good money that this sheepish-looking broad is really one of the bad guys in disguise. In the comics, the Skrulls have at times invaded Earth, using their shapeshifting abilities to pass as anonymous citizens or even influential superheroes. If the Skrulls are already on Earth in big numbers during the '90s, that spells bad things for the state of the world in the present. Are there secret Skrulls already lurking in the Marvel Cinematic Universe? We'd be on the lookout for it going forward. That kind of territory of paranoia and betrayal seems like a natural place for the MCU to explore post-Thanos. 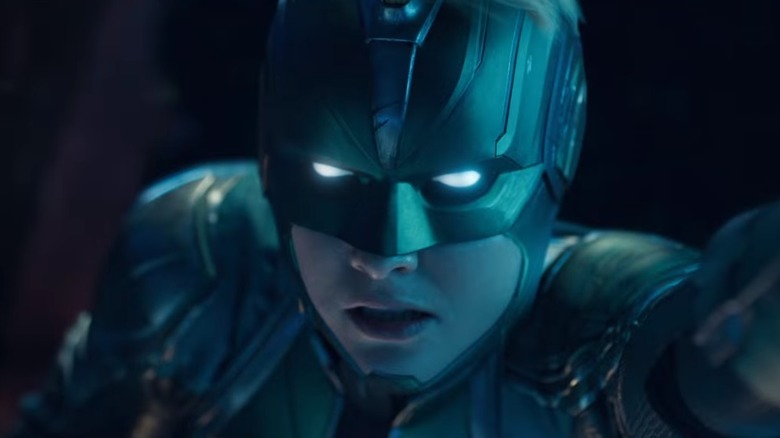 The Captain Marvel trailer gets its first big punchline when Carol, in a Kree outfit and presumably piloting a Kree vessel, crash lands on Earth after a mid-air explosion. Specifically, she smashes down through the roof of a brightly-lit, well-maintained Blockbuster Video store. It's so glossy in the footage, it almost looks like a paid advertisement for the all-but-defunct chain. The nostalgia quotient makes for a decent laugh here, and helps to take away from the whole "Did I just watch somebody die?" factor of seeing a woman hitting dirt from a height of 30,000 feet. Right away, something seems off about Carol when she lands. It looks like the movie will show her having to regain her knowledge of her home world, with her memories having been suppressed somehow during her time away from Earth. It'll be interesting to find out what happened there — since she doesn't look any older upon her return, she can't have been gone all that long. In addition to landing in a Blockbuster, Carol also crashed down in a pretty fitting aisle. Even though she's starting off her movie night with a little mystery, you can see that Captain Marvel's really here for some blockbuster action. Because it's an action-packed movie, get it? You see what they did there? That's cute, right? Following on the heels of Iron Man 3 and Guardians of the Galaxy Vol. 2, Captain Marvel is putting Marvel's de-aging CGI to work with spectacular effect on one Samuel L. Jackson — a.k.a. Nick Fury, agent of S.H.I.E.L.D. It's been a long time since we've gotten to see Nick Fury in his full S.H.I.E.L.D. agent element; in Captain Marvel, he appears to still be rising in the organization's ranks. 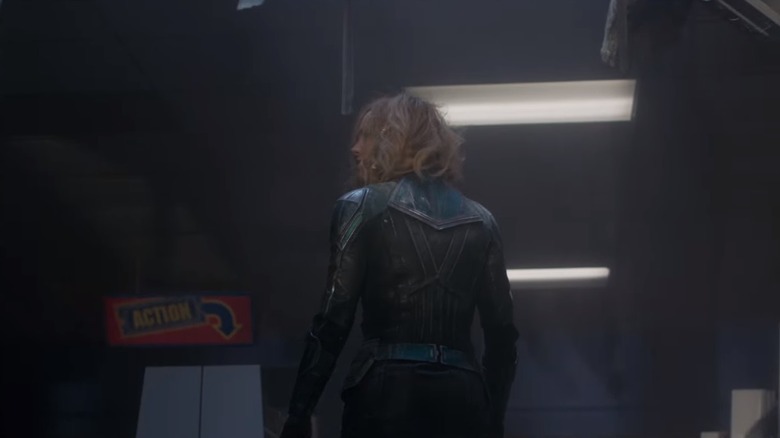 From the look of things, Yung Fury will spend the first act of the movie working to track Carol Danvers down after she busts open that Blockbuster. It seems that, in the early parts of his mission, he won't quite be certain whether or not she's friend or foe. We wouldn't be surprised if, in classic Avengers fashion, Carol and Nick started things off on the wrong foot as he works to track her down and figure out her story. 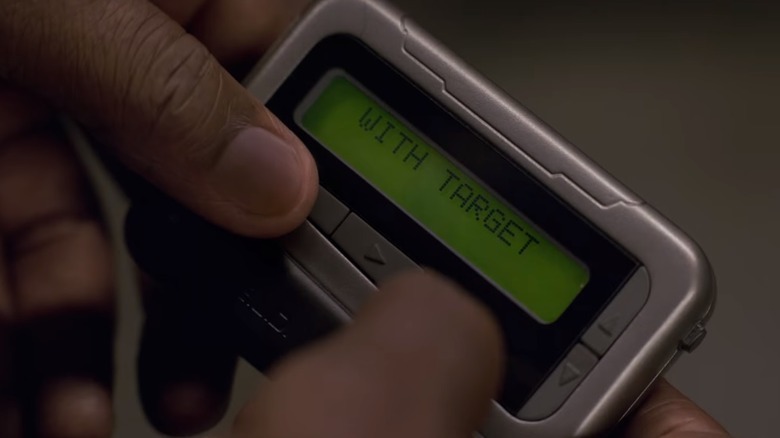 The trailer shows Fury regarding someone skeptically as he holsters his pager after sending the message "With Target," which is a far sight away from "With my new friend, Carol." We know from the end of Infinity War that the two end up at least as pen pals, but it will be interesting to see if they face any opposition from each other on their way to becoming best buds. When Carol first crash lands on Earth, she appears to roam her unfamiliar surroundings in something of a fugue state. Perhaps this alien world, as it would seem to her, doesn't feel so alien after all. The look on her face says "I've been here before" — not this specific location, maybe, but certainly somewhere in this world. It will be interesting to see how Carol handles her recovered memories. How long as she been away? If she can't remember where she's really from, then what does she think her childhood life used to be like? It's heady stuff. 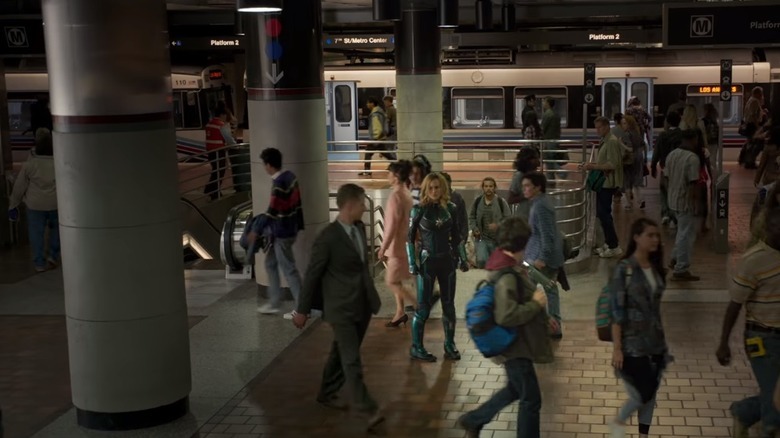 In one scene that seems to take place after Carol has returned to Earth and made friends with Nick Fury but before she's regained her memories, Carol walks the halls of what seems to be a S.H.I.E.L.D. facility, wearing what looks like a fitted agency baseball cap straight from the facility's gift shop. 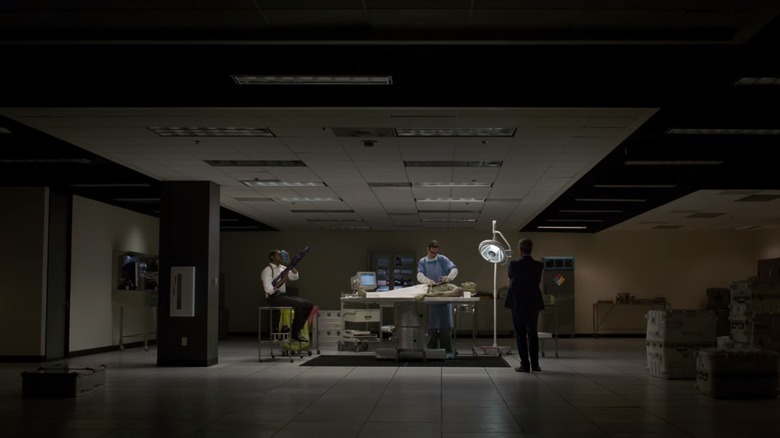 Finally, the first Captain Marvel trailer also features what appears to be a scene of Roswell-esque alien dissection, with what looks like a Skrull's body laying prone on an operating table while a scrubbed-up doctor digs in and a G-man-looking gentleman looks on. Also present in the shot: Nick Fury, holding what appears to be, from this distance, a purple space bazooka. Naturally. The arrival of the Skrulls on Earth in the '90s raises a lot of questions about the MCU of the now. 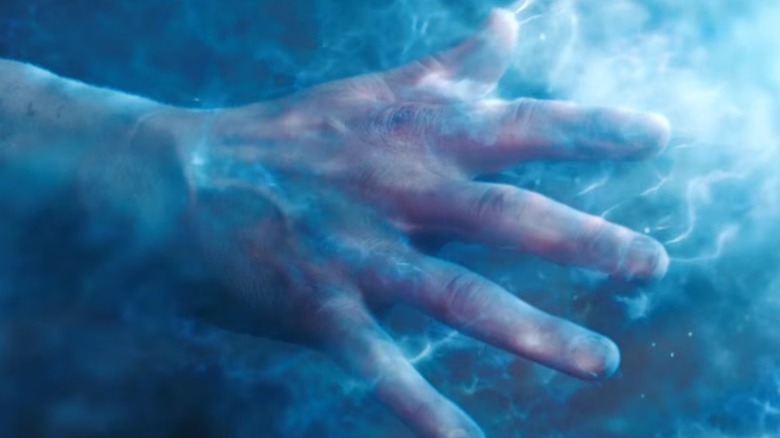 The movie is all but certain to explore the species' shapeshifting powers, and the eerie implication is that there could be spies from another galaxy all over the MCU we know. How much do you want to wager that the next big Marvel guessing game will be "which heroes have been secret Skrulls this whole time"? We'd put that at a virtual guarantee. Will the arrival of these super-spies turn the next 15 Marvel movies into a late-season Battlestar Galactica arc? Time will tell — but if the series' indisputable track record is anything to go by, it'll be a lot of fun to watch unfold, no matter how many times we might've seen that story before.